So just a quick note on what happened: Basically the source that we used (XPG) went belly up, which is very unfortunate. 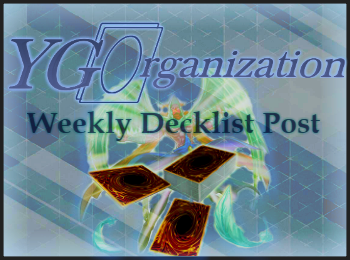 Moving to a different source, the holidays and other issues, we had no OCG Decklists for quite a few weeks (and even after starting to work on them, every week that passed only added more workload). The idea is to go back to weekly postings on Mondays. However, do note that due to using a new source (Izazin), there will be less lists in total, and most likely will be exclusively from Japanese tournaments. -Average number of copies per Deck: So you can tell if players prefer to use 1, 2 or 3 copies of a card. -Total copies used: This is what we had in the previous card ranking. Just the bulk amount of copies used of that card. More popular cards that are ran in multiples will have a larger number. -Side-Decked X% of the time: Just an indication on how often people prefer to Side-Deck the card as opposed to having it in their Main/Extra Deck. For example, Dinowrestler Pankratops is heavily prefered as a Side-Deck card for now. -Total usage per Deck: Out of all the Decks, how many ran the card. If people use very few copies of a card (for example, it’s Limited), but it’s run in almost every Deck, then it will be more popular. That said, this is all calculated based on what people write on their lists. You’ll find that a certain gentleman listed 2 copies of Duster and that will make the stats look weird. Let’s hope that doesn’t happen again. 1 Sky Striker Mobilize – Engage!